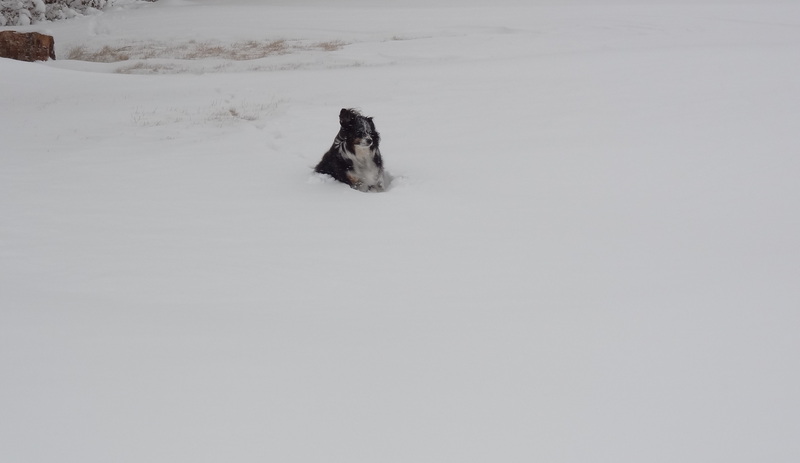 Wylie stuck in a snow drift. When his feet get cold, he sits and waits for me to come and pick him up. This entry was posted in Daily Happenings, On The Farm and tagged Kansas, snow on February 2, 2017 by Debra Farmer. I’ll take the cold without the snow today! I was hoping the little groundhog would have a better prediction, and that spring was closer. Just thankful that these photos were from the past, and that we are not having to deal with snow! That last photo reminds me of one of my best childhood blizzards. 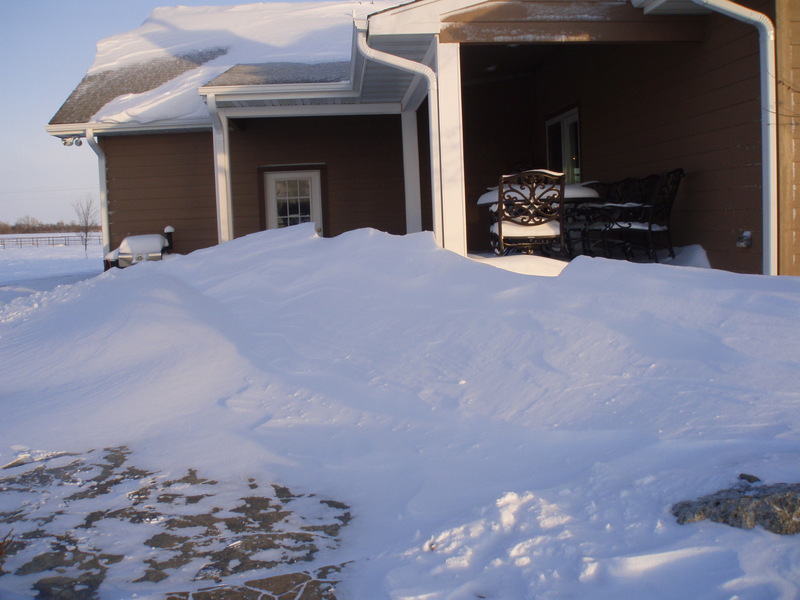 On one side of my grandparents’ house, the drifts went up to the roof. On the other side? Bare ground. The snow-covered side had the door — so dad went out the bedroom window with a shovel in his hand, walked around, and shoveled out the door. That photo of Wylie cracks me up — almost as much as the fact that he sits and waits for you to come and get him. Have you ever seen this video? LOL what a funny video! Bailey loves the snow!!! Wylie doesn’t care for it! His feet get too cold. Thanks for sharing that video! That would be awesome to have to crawl out the window to shovel out the door!! The wind creates such drifts. There is a wheat field to the north of us and there’s nothing to stop the snow. A road grader came by and broke open our lane. Mr. Farmer was gone, so it was up to Wylie and me venture out to chore. I had feed buckets in one arm and Wylie in the other arm. Made it hard for this old granny to get thru the drifts. That was the last big snow storm we had. Last couple of winters have been rather mild. I’m so looking forward to April showers!! Thank you. 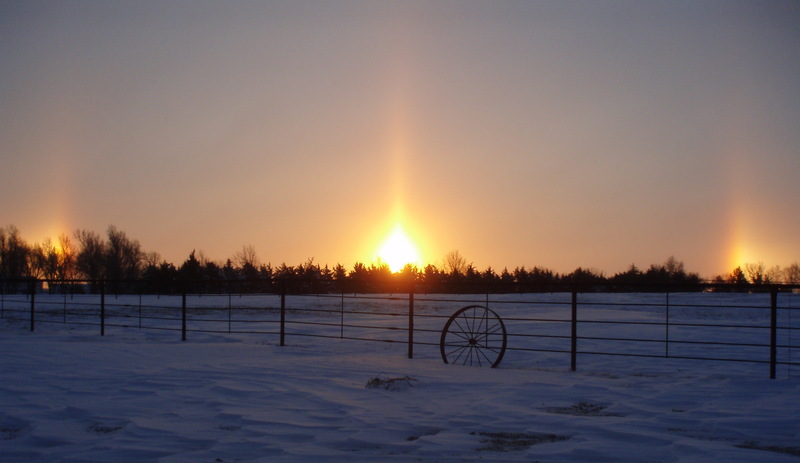 Oh my that was a cold morning out doing chores, but it was worth it to see that beautiful sunrise! !